The decline in central financing for Russia's nuclear complex and the known interest of terrorist groups in acquiring fissile material and technologies, has made the state of Russia's far-flung nuclear enterprises a pressing international issue. 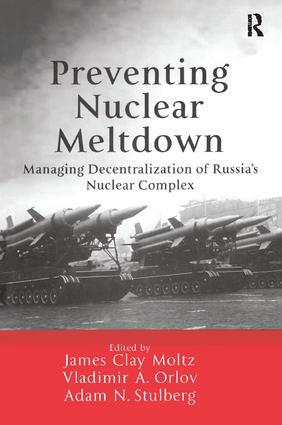 In this important volume, a group of leading US and Russian policy experts - drawing on extensive interviews with officials, facility personnel, and analysts in Russia's regions - explores the intersecting problems of Russian nuclear insecurity and decentralization, including the growing influence of regional, political and economic forces. The work presents insights into both nuclear safety issues and post-Soviet intra-agency governance, as well as detailed case studies of critical nuclear regions: the Far East, the Urals, Siberia, and the Volga area. The volume also offers major new findings on the interface linking Russia's evolving center-periphery relations, its ailing nuclear facilities, and the role played by foreign assistance providers. Contents: Introduction: Russia's nuclear regions, James Clay Moltz. Federal Nuclear Agencies and the Regions: Center-periphery relations and Russia's nuclear infrastructure, Dmitry Evstafiev and Vladimir A. Orlov; Russian nuclear regionalism at the Federal Center, Nikolai Sokov and Adam N. Stulberg; Minatom's regional strategy, Sonia Ben Ouagrham; The military, the regions, and nuclear weapons, Michael Jasinski. Case Studies of Russia's Nuclear Regions: Nuclear issues in the Far Eastern Federal Okrug, Cristina Chuen; Nuclear issues in the Volga Federal Okrug, Ivan Safranchuk; Nuclear issues in the Urals Federal Okrug, Elena Sokova; Nuclear issues in the Siberian Federal Okrug, Dmitry Kovchegin. The Experience of US Assistance Programs and Conclusions: The implementation of US nonproliferation assistance programs in Russia's regions, Michael Jasinski and Charles Thornton; Nuclear decentralization in Russia: lessons learned and new directions, Adam N. Stulberg; Index.